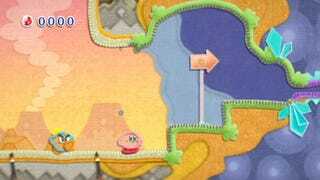 Kirby gets his first game in seven years with Kirby's Epic Yarn on the Wii, a platformer with cloth texture art-style. The game is coming this fall, Nintendo said. The title is the first game from Masahiro Sakurai's new company, Sora. A demonstration showed an adorable Kirby romping around a landscape created from cloth, yarn and threads, turning into a car, balloon and a UFO.